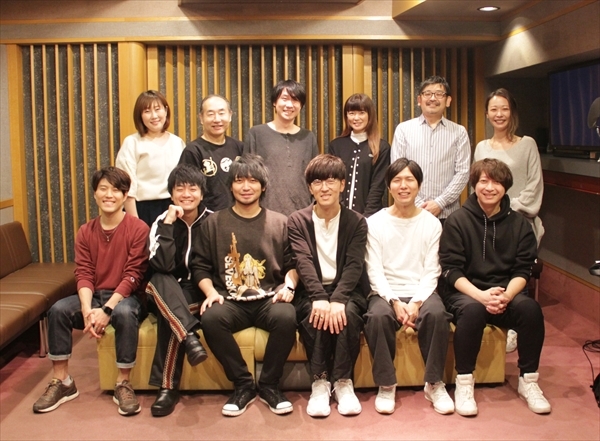 An official post-recording statement along with a photo of the cast for the upcoming anime film adaptation of Mr. Osomatsu has been released. Additionally, in line with the DVD/Blu-ray box set release of season one of the original series, a “Mr. Osomatsu Election” is being held to celebrate the upcoming film. The film is an adaptation of Fujio Akatsuka’s famous comedy manga of the same name. The story follows the sextuplets as they go to a high school reunion. The “Mr. Osomatsu Election” asks fans to vote for their favourite episodes, secondary characters and quotes from the series. Votes are being accepted until December 31 at the official website and pop-up shops at Animate branches in Japan. Fans who vote will be sent an original smartphone wallpaper. Select voters will also have the chance to win a signed posted from the cast of the six siblings as well as a special set normally only available to journalists and those in the media. 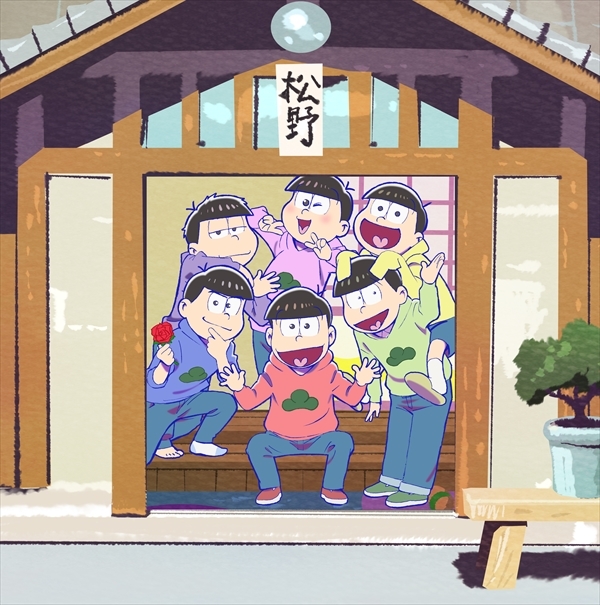 A special site has also opened featuring photos and videos from season one of Mr. Osomatsu. It also includes recommended episodes chosen by the cast. After recording tests for each part we moved onto the real recording without any fuss. Takahiro Sakurai (who voices Osomatsu Matsuno) sat down on the bench where the mark was [on the floor]. He felt fully in character as the eldest brother! During a break for the scene with an animal, there was discussion about how Sakurai is hated by animals. That really lightened the air on set. Before the main recording he even went to call the other cast members who weren’t present. He took the initiative, brought them all together and said ‘Let’s do this.’ He was even speaking to the sound director. He demonstrated an older brother attitude even on set. Yuichi Nakamura (who voices Karamatsu) responding to the other characters’ jokes was really impressive. Like when he played a nihilistic role with Yōji Ueda (who voices Dekapan), or when Aya Endo (who voices Totoko) was explaining why she’s cute, he laughed came back with “What the hell’s with this character?” The other cast members had fun with his words too. It brought a great atmosphere to the set. Another thing he said which brought bitter smiles to faces was during a singing scene. He said, “You’re really not very good.” But during the recording he was swinging his shoulders and singing! I felt Nakamura’s deep affection for Mr. Osomatsu! And Hiroshi Kamiya (who voices Choromatsu) gave it his all in the singing scene too! Before the main recording, he warmed the air by breaking out into song inside the booth where the other cast came back one by one. He hit a home run with his performance of the high schooler Choromatsu. He made the studio control room bust into laughter. And whenever a cast member had doubts with their voice recording he’d say, “No, no. You did great!” He had overwhelming consideration for those around him. It was Jun Fukuyama (who voices Ichimatsu) who said “Leeet’s do this!” when the main recording started. He fired everyone up with a lively voice, something which Ichimatsu doesn’t have. He was a real mood-maker, even the audio director said, “Looks like you’re all ready now!” He spoke kindly to his junior voice actors. He gazed intently at Nobuo Tobita (who voices Dayon) who effortlessly delivered a line for several minutes and who felt respect as an actor for how Fukuyama treats other people. Daisuke Ono (who voices Jūshimatsu) is the complete opposite of his character Jūshimatsu! He didn’t break concentration once in the lead up to the recording! But once it started, he changed completely, it was amazing! Even though until then he was reading the script with a serious look on his face, he became Jūshimatsu in an instant as he stood before the mic and made the other cast members burst out laughing with his lines. He showed his soft side too when offering his mic to Momoko Saitō (who voices Hatabō) who was in a pickle because her mic wasn’t picking her up. Miyu Irino (who voices Todomatsu) was grinning at Jūshimatsu too as always. He gave everyone motivation, saying “That was excellent!” to the cast when they were saying lines for the comical parts of the story. Irino’s angered performance of Todomatsu who will all of a sudden reach boiling point was spectacular. People were looking at him enviously! Not only that, he backed up Kenichi Suzumura (who voices Iyami) too and set off fireworks with Sachi Kokuryu (who voices Chibita) when asking “Which of these mics should I speak into?” I felt his heartfelt consideration as an actor seeing him communicating with everyone for the dubbing. That’s how the recording went – politely and smoothly. It was a long recording session as one would expect from a movie, but nobody broke concentration, and we got it done. Please see the story unfold for yourself in the complete film which the cast gave their complete devotion to! Vote for your favourite episode, secondary character and quotes from season one. One vote per person. You can also vote at Animate stores across Japan at the pop-store to receive a special smartphone wallpaper. Look back over season one and see episodes recommended by the cast.